A nation-wide fundraiser in support of Palestinians in the war-ravaged Gaza Strip has been extended by one week in Bahrain. Royal Charity Organisation (RCO) board of trustees' chairman Shaikh Nasser bin Hamad Al Khalifa yesterday (July 26) gave the go-ahead, reported the Gulf Daily News (GDN), our sister publication. "The new deadline aims to give people, traders, businessmen, oil firms and leading companies an opportunity to contribute to the campaign," RCO secretary general Dr Mustafa Al Sayed told Bahrain News Agency. He pointed out that the aim of the extension is to contribute to the infrastructure which was reduced to rubble by the Israeli offensive on Gaza. "Bahrain will contribute to the reconstruction of the medical and educational facilities," he said, adding that Bahrain Hospital and the artificial limbs factory would be upgraded. Citing compiled figure, he said that over 1400 Palestinians have been treated and rehabilitated at the Bahrain centre for artificial limbs. 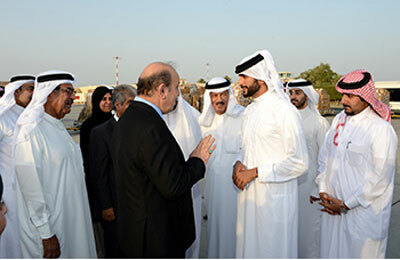 Meanwhile, a Bahraini aid consignment was yesterday dispatched to Gaza, in the presence of Shaikh Nasser. "The consignment, initially weighing 40 tonnes, has been increased by an extra tonne," said Dr Al Sayed, also chief executive of the Bahrain National Committee for Solidarity with the Palestinian People in Gaza. The shipment will be among the first humanitarian consignments to have access to the Gaza Strip. Bahrain is arranging to send a second aid shipment within a few days, in co-operation with the United Nations Relief and Works Agency for Palestine Refugees and the World Health Organisation. The consignment dispatched yesterday includes surgical equipment, medication to administer first aid and treat certain chronic diseases and intravenous fluids. Dr Al Sayed thanked His Majesty King Hamad and paid tribute to His Royal Highness Prime Minister Prince Khalifa bin Salman Al Khalifa and His Royal Highness Prince Salman bin Hamad Al Khalifa, Crown Prince, Deputy Supreme Commander and First Deputy Prime Minister.